The sequel to Call of Juarez is actually a prequel, set 20 years before the original western shooter. In Bound in Blood players take on the roles of the McCall brothers. The story opens with the two deserting the confederate army and becoming outlaws. It ends, we were told, with a confrontation between the brothers. "It's a story about the ties between brothers and how they can be destroyed," said producer Romain de Waubert de Genlis. "It's a very dramatic story, mature, adult." When they set out to make the sequel, the team decided to concentrate on several key features. They wanted to create a visceral shooter, de Waubert de Genlis said, getting back to the sense of the shooter, something action oriented with the focus on shooting. 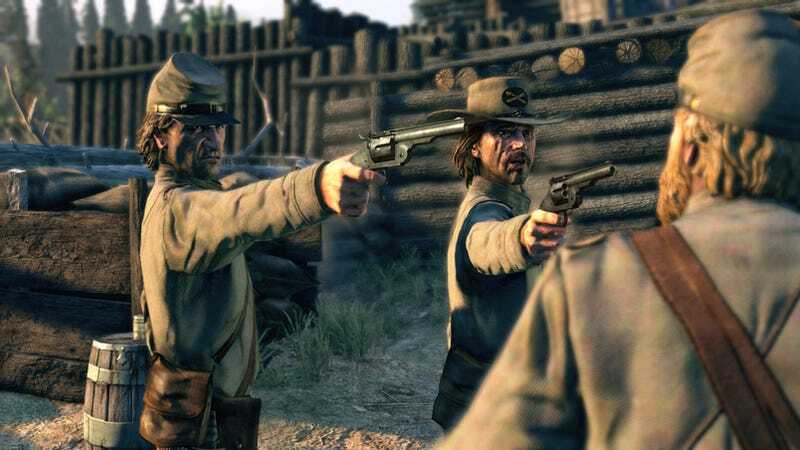 The team added slow motion modes, concentration modes, for each brother to help gamers feel more like gunslingers in the game. They also wanted to make sure to build iconic wild west moments into the game, so you get to rob a bank, attack a train and see plenty of wide landscape in Arizona. The biggest focus, though, seems to be on the cooperative gameplay of the brothers. At the beginning of each level gamers get to choose which brother they want to play as. Each has a distinct style. Ray is strong, skilled in close combat and is a more brutal character. Thomas is the smart one, using long rang weapons. He also can use a lasso to climb to higher vantage points. The developers dropped into the game, about two-thirds in, to give me a chance to check out gameplay, though I wasn't allowed to actually play, just watch. The level opened in a native American village with the colonel of the unit you deserted attacking. The colonel, they tell me, is the game's arch enemy, chasing you throughout the game. The player runs up to find some cover and then uses a mode to slow down time and quickly paints a number of rebs with a targeting reticule. When time resumes, the character unleashes a flurry of bullets from his six shooter, killing all of them. This special mode is activated once you get six kills, an icon shows you it's available, but you have to use it within sixty seconds or lose it. Next he switches to two six-shooters, aiming and killing men as they run up to attack. Once he empties his guns he finds cover to methodically load each chamber of the gun before attacking again. I also get a chance to see some horseback riding, with one of the characters shooting as he rides around the area. The game also features roping, which uses the thumbstick to sort of simulate the movements of trying to lasso an object. Later, in another section, the developers show me a different special mode attack. In this mode you have to fan the thumbstick as if it's the hammer of the six shooter to take out multiple enemies. The game will also have the occasional duel. In this mode you character takes up a large section of the screen, with the camera focus on the player's hip, hand and gun. You can also see the other character standing with his hand ready to draw. Players will have to use one thumbstick to try and keep their character's hand as close to the gun as possible without touching it, and the other thumbstick to try and keep the enemy centered in the screen. When you hear a bell ring you slap the thumbstick toward your gun and your character draws. Then you have to pull the trigger as the targeting reticule automatically zips up from the ground, making sure to hit your target. Without trying it myself, I can't tell how well it will work, but it looks like the type of experience that will be both fun and, in some ways, authentic feeling. Bound in Blood's multiplayer is meant to be a gaming version of cops and robbers, with one side playing as the sheriff and his posse and the other playing as the robbers. While I didn't see multiplayer demonstrated, they told me that it will include a bounty system which increases the pay off for killing a player the better they are doing. The bounty earned in mulitplayer can be used to unlock classes. Multiplayer will also include a wanted mode, with a team trying to take out the single wanted player and his protection. As the presentation wrapped up I asked de Waubert de Genlis why he thinks previous western shooters haven't done so well and why he thinks this one will be different. "There are a lot of reasons for that," he said. "There are trends. The sad reality is that because of what's going on in the world modern warfare has become more popular. Awhile ago it was World War II games. "And I don't think there have been that many good western games with high production value. This is a fast-paced shooter, a very polished experience."